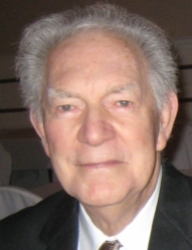 Emile John Brinkmann, Jr., passed away at age 95 on December 3, 2018. Preceded in death by his mother, Viola Schneller Brinkmann, his father, Emile John Brinkmann, Sr., and his sister, Elsie Brinkmann Turner. Survived by his wife of 72 years, Hertha Augustin Brinkmann, brother, Frederick James Brinkmann and sister-in-law Joyce Vignes Brinkmann. Also survived by sons, Emile John Brinkmann, III; Eric Fritz Brinkmann and Carl Rhys Brinkmann; and three grandchildren and five great-grandchildren. Born January 13, 1923, EJ grew up in 9th ward where he learned to play piano well enough to join a new band being formed by his friend Pat Barberot, The Pat Barberot Orchestra that is still playing today. Playing piano and Big Band music were loves he maintained throughout his life. His band days were cut short by the outbreak of World War II, where his initial contributions were working in the Higgins Shipyard as a welder. He later joined the Army Air Corps and served as a B-24 bombardier/navigator doing research in low-level bombing by radar techniques, while doubling as the base piano player wherever he was stationed. After the war, and after much consideration, he decided to give up music as a career and enrolled in the Civil Engineering program at Tulane University. Often during his career he spend his vacations taking his three “well behaved” sons on camping trips across America from the Smokies to the Rockies - a sacrifice for which the family will forever be grateful. In retirement, he and Hertha enjoyed Elderhostel trips domestically and abroad, particularly enjoying the sights of the Southwest US in the wintertime. Family and friends are invited to a visitation On Friday, December 7, there will be visitation at St. Paul Lutheran Church, 2624 Burgundy St, New Orleans, LA 70117 from 10 AM – 12 PM. Service will begin at 12:00 PM. Interment will follow at St. Vincent de Paul Cemetery No. 1. In lieu of flowers, donations to St Paul Lutheran Church, 2624 Burgundy St, New Orleans, LA 70117, are preferred.